Can you spot the Christmas stamp? Yep! That awesome little city scape is actually from Snowglobe Wonderland! And don't forget to stop by the Unity blog to check out this week's SALE!! Great use of that Christmas stamp, Alyssa! Love the card! Cute card!! Love all the colors (which obviously is the point!). Happy new year! Great one layer design, Alyssa. Love the repeat image in various colors. I love the colors! How creative to use that stamp that way! Your city silhouette looks great with that stamp. Fun sentiment with all of those colors. Happy New Year. Love the city card. I have that stamp. What a great idea. TFS Happy New Year. How clever! Love the 3 D effect of you stamping in 3 colors! Great card and stamp! What a smart idea and a fabulous card. Love the colours. Pretty card! Really like how you made the Christmas cityscape into an everyday stamp. I like to do this as a challenge to myself - ESP if I need something and don't have it then try to work it into that. Fun sometimes. Thanks for sharing. Great CAS card! I have this stamp set too and had bought it because of the city scape for non Christmas cards too! I love cards with city scapes on them! Great idea! I'm with jordanbev5...this is a really cute card! Love the colours, nice idea! Very fun and colorful and great way to use this Christmas stamp. What a great idea to put that town silhouette with the senitment from the new itty bitty for this pretty card. Just another example of the versatility of Unity stamps. Just goes to show a little imagination can stretch the use of your stamps. Great job! I love when stamps can be used for every occasion! Very cute! Oh how cute and creative! LOVE this cityscape in the bright fun colors!!! I like the way you used the Christmas stamp! love the use of overlay and the colors you chose! very happy! I love the idea of using a specific stamp for something different. I am going to have to keep up an open mind. Great idea!! Love the card!! Happy New Year!! Great card love the colors you choose and thanks for showing the stamp is not just for Christmas. love the city scape and the colours you've chosen - gorgeous! Wonderful card! Love the city scape! Great way to use a stamp in a new and creative way! New year blessings for you! Wow...I would never have thought this came from a Christmas stamp but, it sure would make for a terrific art journaling stamp! Thank you for using it in a different way! What a creative way to use that cityscape! LOVE! Super cute! I love that skyline! Love the stamped skyline, very colourful! Great use of a Christmas stamp. What a fun card! I love to use stamps from all my sets whenever possible too. Super cute. Love the fact that you found a new way to use a holiday stamp outside of its original use. Thank you for the inspiration. Love that you took a holiday stamp and found a way to use it on something year-round! Simple but sweet! 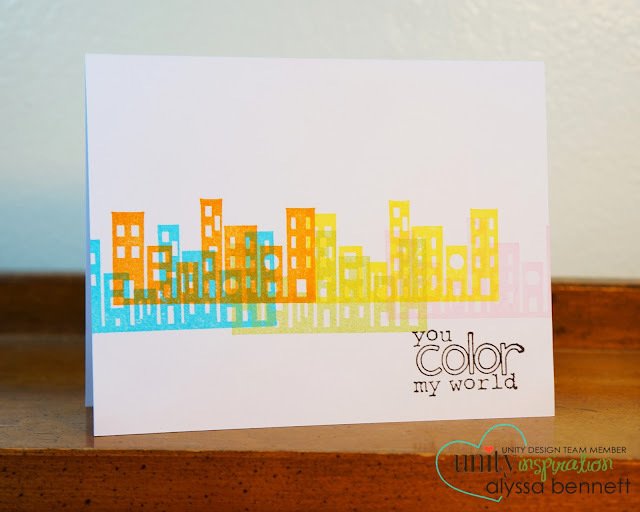 Love how you used the snowglobe cityscape stamp with the different colors! Such a very cool effect you accomplished! I always look to buy stamps that can be reused long after the season is over, so perfect here! Simple and cute!! Love the shadow effect! Thanks for sharing! I love the stamping on this card, that cityscape is fabulous! Love the non Christmas card! Lovin it Cityscapes are so in right now!! what a cool way to stamp the skyline! First time at your blog.... Love your cards!